SEATTLE, Wash. (Aug. 21, 2012) – Whether boosting new tricks in the park and pipe, or floating through laps of powdery face shots in the backcountry is your thing, K2 Snowboarding’s new gear for 2013 has you covered. 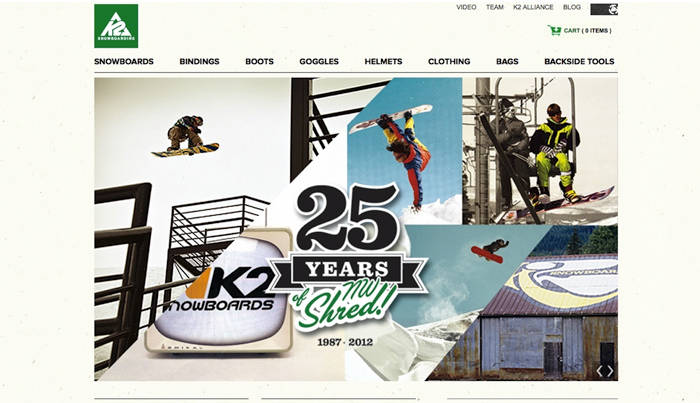 Celebrating their 25th anniversary, K2 launches their new and improved website and goods for the upcoming season. Packed with a fresh look and usability that showcases their most innovative and comprehensive offering of hardgoods, backcountry tools, softgoods, and accessories to date, the new website is your digital portal to the K2 family. · Tweekend™: Added stability, float, and landing power. By extending the Baseline rocker all the way out to the absolute ends of the board, new ride-able surface is unlocked, giving you a bigger, more stable platform to press, float, and land on. · Bambooyah™: The Bambooyah core is a skate inspired, horizontally laminated bamboo core that offers a superior strength-to-weight ratio. Able to take a beating, a little Bambooyah goes a long way. Offered on more models in its second year. · BC Shaping: A new approach to powder and backcountry board shaping. This revolutionary philosophy brings more control, stability and ways to draw lines in the fresh. The new shape of pow turns. · Boa Conda™: The patented K2 CONDA System allows you to tighten, loosen, or adjust your liner on-the-fly – from outside of the boot! The first time you try this, you’ll wonder how you ever rode without it. Fit on the fly. · Tweakback™: Tweakback highbacks are made from a pliable urethane – designed for maximum freestyle flexibility. Stable and supportive when engaged, loose and bendy when riders get grabby. Tweakback offerings expand out into more binding models this year. With new technologies comes fresh new gear. For men, the new Ultra Dream and Peace Keeper boards are your go-to weapons for backcountry and all-mountain shredding. In its second year, the K2 Panoramic splitboard gives you freedom to access the less-traveled goods. The new, simply designed Happy Hour collaboration with Airblaster offers clean graphics and key technologies, while a stacked quiver of all-mountain and park and pipe boards round out K2’s collection. The new Company IPO binding is designed off of the in-line Company binding, but beefed-up to include Tweakback™ for the perfect balance of tweak and support. For boots, check out the Thraxis, UFO, and T1 which all use the Boa Conda™ system. For the ladies, the new Lite Collection of boards features six new models for all types of riding. Plus, a portion of all Lite Collection board sales goes to The Breast Cancer Research Foundation. The women’s Agogo binding is a favorite of the K2 Women’s Alliance and the new women’s Contour boot is the ultimate of fashion meeting function. The stylish Contour boasts new technologies and a luxury handbag-inspired aesthetic. This year, K2 Snowboarding adds a couple new pieces to its Backside Tools collection of backcountry gear. The quick and easy to use Speed Link Pole is the first backcountry pole designed specifically for the needs of snowboarders. The pole features four segments that collapse within each other and packs down to a mere 13 inches. The new Speed Shovel uses lightweight aluminum and quickly converts into a solid rescue sled. These tools join K2’s series of packs, probes, and climbing skins.